It must be difficult for an author to write a sequel to a phenomenally successful book which has been much loved by readers. They must worry about how it will be received, will your readers approve of what happens to the familiar characters. As a reader, it can be a worry too! Like many others I loved Me Before You when I read it although I have a bit of a love-hate relationship with the ending. And I would say that you have to read Me Before You before this book. You could read it as a stand-alone but it will be a much richer experience if you know the full story. I was a bit apprehensive to read this book but at the same time, having read many Jojo Moyes books I was pretty confident that she would have a great story to tell that I would enjoy. I was keen to know what happened to Lou after her relationship with Will came to a devastating end. She has been drifting around Europe for a couple of years, trying to put what happened behind her. When we meet her at the beginning of the book, she falls off the roof of her London flat and survives, although with pretty serious injuries. She goes back to her parents house to recuperate and it was great to meet her slightly chaotic family again. They add a lot of humour and funny moments to the book, despite some of the difficult circumstances. This book is very much about Lou moving on and indeed, she attends a group of that name, aimed at helping people move on through difficult losses. It is at these group meetings that I felt we got a real understanding of how Lou is dealing with life or not as the case may be. She feels a fraud at first but gradually comes to trust the other group members. Lou’s sadness and emptiness is well expressed by the author and I felt that this was realistic portrayal of how someone might feel if in Lou’s position. There are quite a few twists in the story. There is a love interest for Lou although she finds taking the step towards a new relationship a confusing and scary prospect. A unexpected, troubled visitor turns up on her doorstep, claiming a connection to Will that surprises Lou. She muddles her way through dealing with this visitor in a way that is healing to both of them. There is drama too and Lou is in the back of more ambulances than I am sure she thought she ever would be! I really loved this book and spent a weekend curled up in a comfy chair with the book. 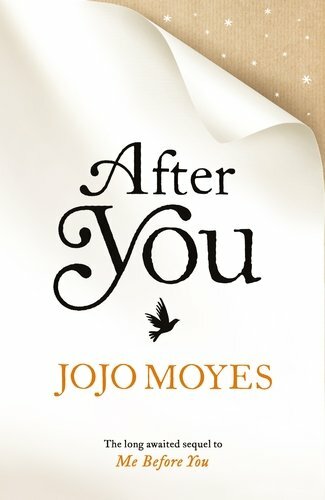 I think that Jojo Moyes has written an excellent follow-up to Me Before You, showing how so many lives can be affected by loss and sadness, but also how there is always hope that there can be a brighter future. It was a book that made me feel quite emotional for Lou but also made me laugh at times. I enjoyed watching her beginning to rebuild her life and dealing with the upsets which happened on the way, as she tries to fulfil her promise to ‘live well’. The way the story ends suggests there might be a third book about Lou and I very much hope there is. Lou Clark has lots of questions. Like how it is she’s ended up working in an airport bar, spending every shift watching other people jet off to new places. Or why the flat she’s owned for a year still doesn’t feel like home. Whether her close-knit family can forgive her for what she did eighteen months ago. And will she ever get over the love of her life. What Lou does know for certain is that something has to change. Then, one night, it does. But does the stranger on her doorstep hold the answers Lou is searching for – or just more questions? Close the door and life continues: simple, ordered, safe. Open it and she risks everything. But Lou once made a promise to live. And if she’s going to keep it, she has to invite them in . . .